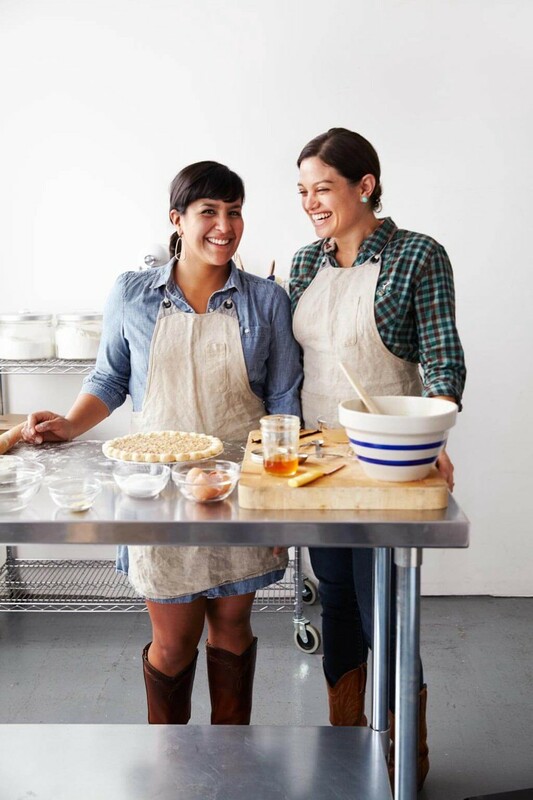 My name is Lenore Estrada and I’m the co-founder of Three Babes Bakeshop, a small bakery business located in San Francisco. We’ve been open for almost 8 years and are known for our pies, but we also sell breakfast pastries, cookies and cakes, to retail customers, corporate foodservice programs and food delivery startups here in the Bay Area. As we’ve grown, wholesaling has become an increasingly important part of our business — it provides much-needed stability and volume during the slow season (basically, that’s any time except for the major pie-eating holidays you can think of). Assuming, of course, that people actually pay their bills. Munchery stole $20,000.00 from our company. How is this ok? Munchery is a venture-backed startup. They’ve been around for about 8 years as well. In fact, once upon a time (before they ever raised any venture money) we both shared a landlord in San Francisco’s Mission district. Since then, Munchery has raised more than $120 million dollars from the likes of Menlo Ventures, Sherpa Capital, and several other well-known venture firms. They also are (I guess I should say “were” at this point) a regular customer of ours for the past three years, with an average order size of $450 once per week. Munchery wasn’t a huge account for us (some of our bigger customers purchase up to $15,000/week with us) but they were a solid, regular source of business and they always bumped up their order volume significantly for Thanksgiving. In 2018, they ordered over 1,000 pies to deliver to their Bay Area customers during Thanksgiving week, a $15,000 order. That week I pulled 4 consecutive all-nighters to help bake all the pies we needed, including almost all of Munchery’s pies. I was and am a new mom — at that time my baby was two months old — and I left him at home with a nanny while I worked from 10pm to 7am each night. It was hard work but we completed and delivered their order. Our successful end of year run in 2018 allowed us to start offering healthcare to our employees and we began thinking about getting our own space in 2019 so that we could begin to service more customers. As per standard food industry practice, Munchery had 10-day terms with us. This means they had 10 days to pay us after their order was delivered. Generally, terms in the food industry can be anywhere from 0 to 90 days, depending on the length of time you’ve worked with a vendor, their credit worthiness, their size and the frequency of their orders. Munchery often sent payment a few weeks late, but eventually everything seemed to get paid. Honestly, most of our other vendors have even longer terms and are just as late with payment. The bigger the customer, the longer they expect their terms to be, and the worse they tend to be about paying on time. Unfortunately, if you want to do business with larger accounts, you have to accept that you’ll be waiting a while for your money. We’d call and email several times a week to hound them, and eventually we’d get paid, albeit around 6 weeks late. I’ve purchased from Munchery a few times and ended up on their marketing listserve, so I was on the list of customers who received an email last Monday to let us know that Munchery was shutting down. I was alarmed— we had a large order that was in the process of being made at that moment for delivery to them the following day. What’s more, they owed us for our entire Thanksgiving order, plus several additional weekly orders, for a total of over $20,000.00. I assumed we’d receive some kind of correspondence from them momentarily and checked all of my email addresses repeatedly that evening, but neither I nor any of the other vendors I’ve spoken with (at least ten companies as of the time I’m writing this) received any notice from them. Nothing to to let us know they were closing, nothing to cancel their standing orders, and certainly nothing to give us a timeline on getting paid. I assumed we’d hear from them the next day at the very least, but the next morning there was nothing in my inbox from Munchery. This was surprising to me. We’d also been vendors to Sprig, and when they shut down a few years ago, we received a thoughtful email from its founder and a check within a few days for the final balance we were owed. I thought I might still have a chance at getting our money if I was able to speak to someone at Munchery before they went into bankruptcy proceedings, so I drove down to their headquarters in South San Francisco and chronicled the adventure on a (now viral) Instagram story. Since then, we’ve been contacted by dozens of other vendors, former employees and customers who were left high and dry when Munchery ran off a cliff. The vendors in my immediate circle of friends and acquaintances alone are owed over $50,000, and a number of former chefs from other cities wrote in with stories of the vendors they worked with reaching out in the months after Munchery closed in LA and Seattle to beg for contact info at the company as they still hadn’t been paid. In a particularly damning missive, one person claiming to be a former employee wrote in to describe the systematic refusal to pay small, women-owned businesses as they had fewer resources to fight back. It’s true about the fighting back thing. Small food businesses in general don’t have a lot of extra resources and many of my peers have had to choose between hunting down their money and fulfilling their orders for remaining clients. I’m lucky enough to have over a dozen amazing employees who can continue making pies even if I’m gone for a few days, so I’ve spent the past week trying everything I could to get Munchery to pay up. One former employee wrote in with the CEO’s cell phone number (nobody answered) and another wrote in with a contact in HR. Although she couldn’t help me, she took down my information and said she’d have somebody call me back. Although our Instagram story got a lot of traction, I could see that most of the viewers were women, so I eventually headed to twitter, where I blasted Munchery CEO James Beriker and Munchery investors Sherpa Capital and Menlo Ventures every twenty minutes for a the better part of a day. That afternoon (miracle of miracles!) James Beriker called my cell phone. “You emphasized how unexpected Munchery’s closure was, but you had the wherewithal to send a well-written email to your customers. Why didn’t you afford your vendors the same consideration. Some companies continued to make product (that you are never going to pay for) after you’d shut down, as you didn’t even bother to cancel your standing orders. Why didn’t you email us?” To his credit, he apologized for not contacting us and said it was a misstep (although even now, eight days after they closed, none of the other vendors I’ve spoken with have received notification of any kind from Munchery). I said “Look, I understand that you were probably trying to raise money or sell the company, but you could have shut down months ago and paid us what we were owed. Why should OUR companies bear the burden of YOUR risk? We get no upside if it works out. How is that ok?” (I’d seen his LinkedIn page and knew he was a former Mergers and Acquisitions lawyer and that he’d had several short stints at companies to bring them to an exit.) Again, he said “the situation is more complicated that you know. We gave it a good shot and it just didn’t work out. We’ve been at it for eight years and I’ve been here for two of those.” That actually really bothered me. I’m an operator whose been at it for eight years. I would never screw my farmers or employees and chalk it up to “a good shot” that didn’t work out. Many times, I’ve gone without pay so that we’d have enough to pay our people and our vendors. I couldn’t imagine Beriker doing the same thing. I said, “I hope you are embarassed. I know that’s kind of mean, but I really hope you are.” I told him that my friends and I would miss rent payments, take out loans, wait another year to expand or buy equipment, miss payrolls and worse because he failed to run his company responsibly. I told him I’d heard from so many vendors, employees, and customers who had borne serious consequences as a result of his mismanagement. I told him that we were suffering and that it bothered me that he wasn’t suffering too. At that point, he actually got angry. He told me that I should never assume I understand what someone else was going through. He said that I had no right to assume I knew what he was feeling or how this situation was affecting him personally, and that he had also been fired on Monday, but was staying on to manage the company as it wound down. I didn’t ask him if he’d gotten severance but I should have. In an attempt to end the conversation in a productive way, I asked him what next steps were in the process. He said someone would contact me on Monday (that would be yesterday) with next steps. Predictably, that didn’t happen. Munchery exhibited a pattern of closing abruptly and leaving their debts unpaid in a venture-scale version of dine and dash, without any regard for all of the people left in the lurch when they skipped town. Munchery’s CEO and their board should have been responsible for closing the company before it imploded. This isn’t just capitalism, it’s downright theft. Munchery’s leaderhip has known they were in trouble for years. They brought in a new CEO when they recapitalized the company, and sold off assets, all the while continuing to rack up bills they knew they would never pay. How is it ok to raise $125M dollars, spend it all, recap the company, jettison employees, and then knowingly buy services you are not going to pay for? The more we learn about Munchery’s dishonest dealings with vendors, customers and employees, at what point is this just greed and when is it criminal? Would we let a gambler run up credit card debt and then forget about it because he’d planned to win it all back in a poker match but then it didn’t work out? Absolutely not. So why are we letting Munchery get away with the same behavior? This is part of a larger story of VC funded startups ripping off the community on their way up and their way down. Their inevitable collapse under unsustainable business models hurt customers and the community yet leaves VC’s unscathed. Why are we letting this happen? Where is Munchery’s board? Former board members Shervin Pishevar and Pravin Vazirani but who has replaced them at Menlo Ventures and Sherpa Capital, respectively? Why is nobody holding the VC firms accountable for providing oversight? How is it ok to accept that they may have just “abandoned the seat” because they thought the investment was a loser? VCs routinely write checks to help companies wind down responsibly. Why didn’t Menlo Ventures, Sherpa Capital and the other VC’s do this? It’s not a lot of money, especially since they take in millions of dollars in management fees, even if their portfolio companies never make a profit. We refuse to be the ones holding the bag on what is seeming more and more like a ponzi scheme. How can we as a society sanction this behavior? Today (Tuesday, January 29th) at 10am we’ll be conducting a protest outside of Sherpa Capital’s San Francisco office at 800 Market Street. Come say hello, learn more, and grab a cookie.